Julian Sensley's 3-pointer with 2.2 seconds left on Saturday gave UH a victory over San Jose State and its first road sweep since 2004. 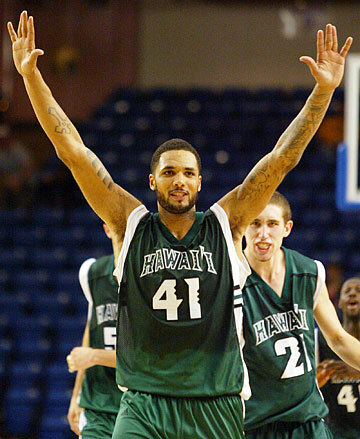 The Hawaii basketball team that has proven to be a strong finisher in recent games is looking to end the regular season in similar fashion. It's been a sometimes rocky ride over the three-plus months since the team's season-opening upset of Michigan State. However, the Rainbows arrived at their final homestand still within reach of a high finish in the Western Athletic Conference and a postseason invitation. After a 4-4 start to the WAC season, the Rainbows went 6-1 in February to remain close to the top of the league. "They've really held together, grown as a team," UH coach Riley Wallace said. "They take coaching, they have worked hard in practice to improve their games, individually and (as a) team, and they like each other and play together." UH has posted second-half comebacks in each of its last four wins and enters the week with control over its seeding in next week's WAC tournament. The Rainbows are tied with Utah State for fourth place, thanks to a rare road sweep last week, and close the schedule against the teams just ahead of them in the standings -- New Mexico State and Louisiana Tech. The Rainbows (16-9, 9-5 WAC) begin their final homestand against NMSU (15-12, 10-5) on Thursday and celebrate senior day against LaTech (18-11, 10-5) Saturday afternoon at the Stan Sheriff Center. UH is the only WAC team that has yet to lose a league game at home, and the perfect 6-0 mark will be challenged this week. The Rainbows lost three-point games to both teams on the road in mid-January. NMSU, picked eighth in the preseason coaches poll and seventh by the media, rallied from a 12-point second-half deficit to win 87-84. LaTech beat UH for the fourth straight time with a 65-62 victory in Ruston. "We had a good lead on New Mexico State down there and got into a transition game with them and they beat us," Wallace said. "Louisiana Tech has always played us tough here. We've got our work cut out." LaTech spent much of the season atop the conference before being passed by Nevada. The Wolf Pack has won nine straight and clinched at least a share of the title with an 18-point win at Utah State last Saturday. Nevada, ranked No. 24, can clinch the outright title and the top seed at the WAC tournament, which opens March 9, with a win against either San Jose State or Fresno State this week. The 'Bows avoided what would have been costly stumbles against the WAC's bottom two teams last week. UH battled back from a 14-point deficit to win at Idaho last Wednesday and needed a 3-pointer by Julian Sensley with 2.2 seconds left to beat San Jose State 61-60 on Saturday, completing its first road sweep since 2004. "It gives you confidence that you can hang in games and come back and win them," Wallace said of the comebacks. "Before, we tried to play a different game down the stretch on the road, run and shoot them out. (Last week) we ran our offense and worked it and did a much better job." Aloha means goodbye: Saturday's game will mark the final regular-season home appearances for four UH seniors -- Sensley, center Chris Botez, forward Matthew Gipson and guard Deonte Tatum. They will be honored in the traditional senior ceremony after the game, which tips off at 5:05 p.m. at the Sheriff Center. Postseason outlook: WAC commissioner Karl Benson hopes teams at the top half of the conference will extend their seasons beyond the conference tournament. "The WAC is on very solid footing to have a minimum of five teams participate in the postseason," Benson said during yesterday's WAC teleconference. The top five teams are above .500. Sixth-place Fresno State will end its season Saturday at Nevada due to a self-imposed ban on postseason play.